Best White Fish Dinner Ever! | Leasa's Place. Best White Fish Dinner Ever! No word of exaggeration, this is by far the best pan fried fish dinner we’ve ever had. It all came together so nicely and each aspect complemented the fish so wonderfully. If any restaurant offered this exact meal on it’s menu, I’d buy it again and again. Steam green, yellow beans with baby carrots. I took 4 mid sized pieces of cod, about 3/4 inch thick, dried them well, generously seasoned with tarragon leaves, onion powder, sea salt (to taste) and white pepper, dipped them in whipped egg then a mixture of 1/2 cup of panko bread crumbs, 1/4 cup of all purpose flour and fried one each side for 2 to 3 minutes in hot olive oil mixed with unsalted butter (if you have super thick fillets, put a lid on to ensure they are cooked in the middle). When fish is done DON’T OVER COOK!!! place it on a nice large serving tray and place in warming oven. In the pan that you did your fish in, put 1 generous cup of grape tomatoes cut in half, 1 cup of mushrooms chopped coarsely and 4 large cloves of garlic chopped finely, 3 tbsp butter and juice of one lemon, stir fry quickly until tomatoes soften and it’s heated through. 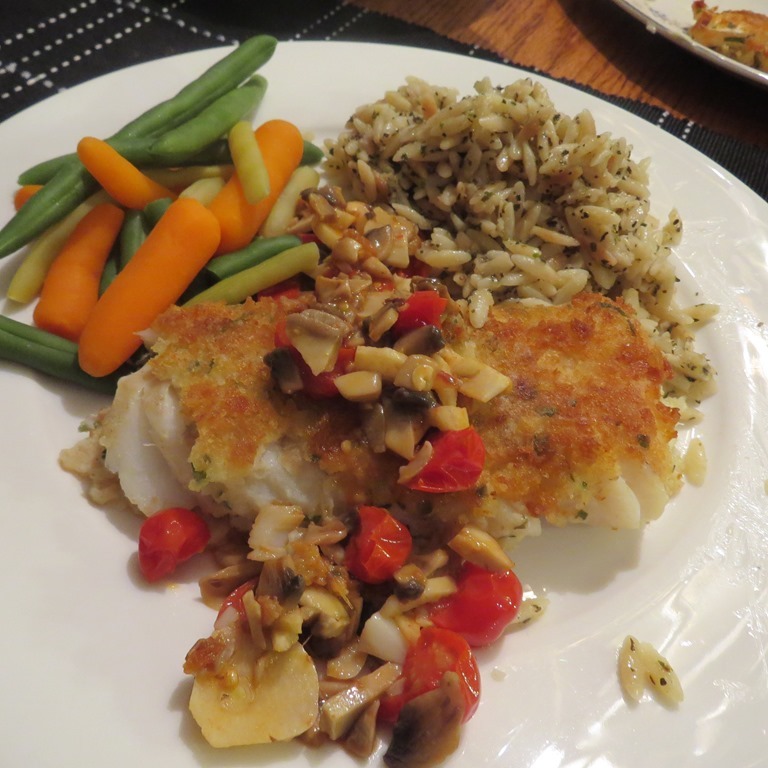 Serve the stir fried portion over the fish and orzo and vegetable on the side. OMG….you won’t be disappointed! Any questions, just ask!